To make things a bit easier for you, we offer this brief response to Frequently Asked Questions. If you have additional questions during the service (we call our services Meetings for Worship), feel free to ask someone nearby or one of the ushers at the back of the meetingroom. We are grateful when newcomers visit – and sincerely hope to see you soon. Can anyone visit a Quaker Meeting? Absolutely. More than 60 percent of the First Friends community arrived at a Quaker meeting first as a visitor. In other words, most of us were not raised in the Friends’ tradition but found our way to Quakerism as adults. You will be warmly welcomed! As with most things at First Friends, we’re diverse. You will see some folk in shorts and flip flops and some in ties or dresses, so come as you feel most comfortable. Your children are welcome to stay with you throughout the worship time. We love having young ones with us during meeting. If your child is under the age of 5, there is a nursery available staffed by two experienced workers. Feel free to ask an usher or someone sitting close to you how to find the nursery. Our meetinghouse is a bit of a maze. Yes. About 20 minutes into the hour, an offering is collected. We do not expect visitors to contribute although gifts are always welcome. If the plate comes to you – feel free to just pass it on. No, you will not be singled out. You will simply be part of our community as we worship God. You will be invited to fill out one of our “little yellow cards” from the pew pocket in front of you and place it in the offering plate. This gives us an opportunity to learn your name and how it is that you happened our way. You can also request getting on our e-newsletter list or ask for a call from one of our pastors or elders. Where do I park? Can I find my way around? Handicap parking is available in the circle drive off of Whittier Street. To enter the worship room from Whittier Street, go to the door furthest to the right. The other parking lot is on the lower level on the east side of the meetinghouse. If you are attending the 9 am unprogrammed service, please enter the door closest to Friendly on the lower level. Then make a left into the first door on your left. 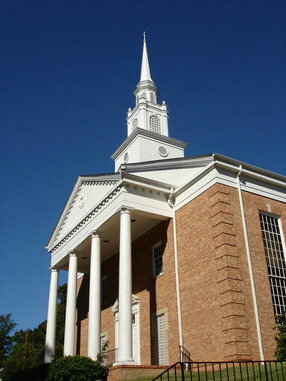 For the 11 am Meeting for Worship, take the sidewalk up the incline and enter from the Friendly Avenue main entrance. There will be greeters to welcome you and offer you a Sunday bulletin. Quaker faith and practice are built upon our personal experiences and shared convictions, rather than doctrinal creeds. We understand baptism and communion to be primarily inward, spiritual realities, rather than outward rites. Our time of silence and open worship (typically 15-20 minutes) is often identified as “communion in the manner of Friends”. Are you Quakers or are you Friends? We are both and those names can be used interchangeably. Our official denominational name is “The Religious Society of Friends” but early on we were nicknamed Quakers… but that’s another story which we’d love to share in person. Worship at First Friends Unprogrammed Meeting for Worship This begins at 9 am Sunday and offers an opportunity for 45 minutes of worship in the manner of early Friends. After a few minutes of opening silence, a short passage is read followed by our time of waiting worship. Frequently a message arises out of the silence. We close meeting with a “circle handshake” and enter into a time of worship sharing followed by announcements. We meet in the gathering room on the lower level and are delighted to welcome visitors. To find us, park in the main lot and go in the door on the south end of the building and then take an immediate left into the gathering room. Programmed Meeting for Worship Begins at 11 am Sunday and offers an opportunity for worship incorporating silence, sharing, singing, music from the choir, prayer, and a message from the pastor, a Meeting member, or guest speaker. At First Friends, a typical 11 am programmed service looks like this: music prelude beforehand a friendly welcome with announcements, joys and concerns an opening hymn a short message for the younger children choir anthem or special music an offertory a reading from the Bible a short message from the pastor or someone from the meeting 15 to 20 minutes of open worship, often with a person or two speaking out of the silence. a closing hymn a benediction and an encouragement to shake hands with your neighbor. Worship varies some each week — it’s never completely predictable. On occasion a carefully prepared message or chosen hymn will be abandoned, if we feel the Spirit leading us in a different direction. Worship usually lasts about one hour, but we’ll finish early or sometimes go a bit longer if it feels right to do so. Our goal in worship is to listen to God, and follow the Spirit’s leading. Community Outreach There are many ways First Friends Meeting helps serve our community: We open our doors to numerous recovery groups – at least ten different 12 step groups gather regularly at our meetinghouse. 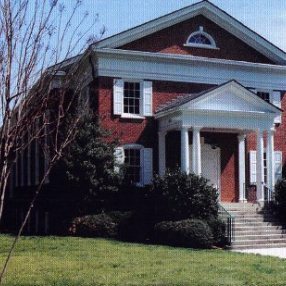 We provide space for Guilford Country School groups, and serve as being a polling site. 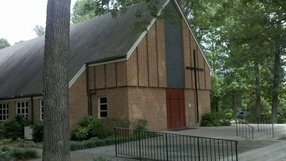 Our Meetinghouse is available for weddings and union/commitment services. Besides providing our own food pantry every fourth Thursday of the month, we also serve a monthly meal at Urban Ministries. Through our Peace & Social Concerns committee we are involved in service projects such as Family Promise (working with families who are homeless), Out of the Garden (a food backpack program) as well as joining with other faith groups in working for peace. I was in my early 30s when I was first walked through the doors of a Quaker Meeting and eventually became a “Convinced Friend.” After completing seminary, I served as a pastoral minister in West Branch, Iowa; Perth, Australia; and Spokane, Washington. 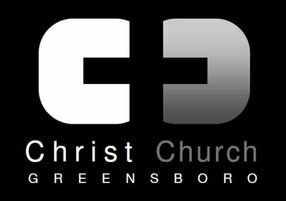 In the summer of 2004 my husband Tim Jackson and I were delighted to move to Greensboro and make First Friends our church home. Some of “my favorite things” include good coffee with cream, spicy foods, traveling anywhere warm, dancing music, reading mysteries and stumbling upon a really satisfying movie. I also love to engage in conversation about our faith journeys. Go here? Tell us why you love First Friends Meeting. Visited? Tell us what a newcomer can expect. Enter your email address to receive an informative welcome email from First Friends Meeting.